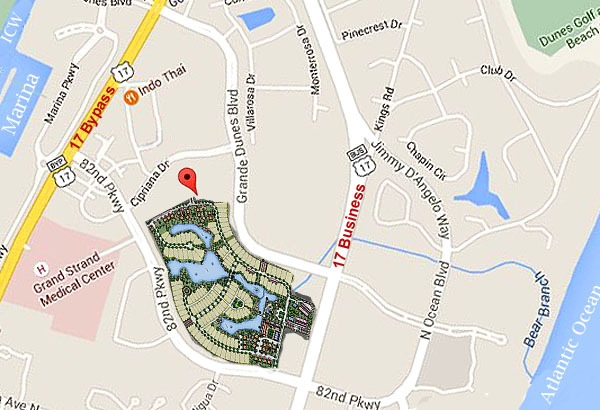 Phase 1 of the newest Grande Dunes community has just begun. Initial plans for the new Living Dunes community feature 134 single family home lots, 52 coupled cottages, and 33 townhouses with all the charm and elegance of Grande Dunes. Enjoy the perfect coastal living experience. Residents will be members of the first Gigabit community in Myrtle Beach, with access to fiber optic broadband internet providing safer, high-speed connections. The Grande Dunes private beach and incredible oceanfront country club with pool and more are only a block away and you can take a golf cart to many places, including numerous golf courses. Over 8 miles of nature trails wander through 10 acres of parks, green spaces and picturesque lakes. Living Dunes will have its own neighborhood amenities, as well. Plans include a large “Y-shaped” lake with nature trails, numerous small parks, a waterfront park, a hammock park, and more. The community clubhouse will feature a pool and pavilion. There will also be a boardwalk and waterfront café. Intrigued? Visit our website to learn more and call Grande Dunes real estate expert, Greg Harrelson at (843) 536-8383 to schedule a private tour of the homes for sale in Living Dunes.